The Moringa plant is being hailed as a way to combat famine and malnutrition – with good reason. The leaves are an excellent source of plant protein, and at 27% is considered to have the highest protein ratio of any plant so far studied on planet earth. It contains 18 amino acids, [including the 8 essential ones], 25 minerals and vitamins. With regard to beta-carotene it has as much fibre as carrots but 4 times the beta-carotene content. Moringa also contains EFAs: omega 3,6 & 9, chlorophyll, various phenolics, over 46 naturally occurring antioxidants, and 36 anti-inflammatory compounds. Impressive, don’t you agree? Tiny leaves – tre[e]mendous power! More than enough evidence to include it in one’s diet. Moringa oil can be used for cooking [marinades, sauté, stir fry – flashpoint 200C], or as-is on salads and veg. It can also be used in baking as a butter substitute, since it has a buttery flavour. Try making popcorn with it and taste the buttery, nutty difference! Zeatin is a member of the cytokinin family, a class of phytohormones involved in various processes of growth and development in plants. Quercetin is a type of plant-based chemical, or phytochemical, known as a flavonoid antioxidant, that has antiviral and anti-allergy effects. Beta-sitosterol is a phytosterol that reduces blood cholesterol levels, and helps prevent male hair loss [in combination with Saw palmetto], and treats benign prostatic hyperplasia [BPH]. Caffeoylquinic acids are cinnamate conjugates derived from the phenylpropanoid pathway, which protect vascular endothelial cells against oxidative stress. Kaempferol is a polyphenol that is a type of flavonoid, known as a flavonol. It is found in a number of foods consumed by humans, including Brussel sprouts, tea, grapefruit, broccoli, apples, onions, red wine, and many berries. This compound has been found to have a protective effect on human health and studies suggest that it protects against heart disease and cancer. Kaempferol was specifically identified as a food ingredient that lowered the risk of fatal heart disease in women. Several different flavonols appear to have protective effects on human health. Kaemferol is also a strong antioxidant, which helps to help prevent oxidative damage to cells and DNA. It is thought to prevent arteriosclerosis by this mechanism. Protecting DNA from oxidative damage can also help protect against cancer, by preventing mutations from occurring. With Moringa nothing is wasted. The seedcake remaining after extraction is used as fertiliser, so the cycle continues. Moringa seeds have an invaluable impact on health and the environmental with regard to its unique ability to purify water. The seeds treat water on two levels, acting both as a coagulant or flocculant, and an antimicrobial agent. It is generally accepted that Moringa works as a coagulant due to positively charged, water-soluble proteins, which bind with negatively charged particles [silt, clay, bacteria, toxins, etc.] allowing the resulting ‘flocs’ to settle to the bottom or be removed by filtration. The antimicrobial aspects of Moringa continue to be researched and findings support recombinant proteins both removing microorganisms by coagulation, as well as acting directly as growth inhibitors of the microorganisms. 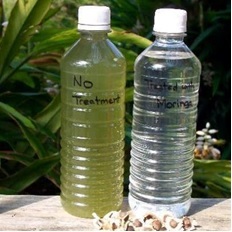 While there is on-going research being conducted on the nature and characteristics of these components, it is accepted that treatments with Moringa solutions will remove 90-99.9% of impurities from water. Wow! The medicinal uses are the stuff of legends, as can be seen below. Conditions range from A-to-V, so to speak – from abrasions to viruses – and even more! Abrasions/grazes, acidosis, anaemia, arthritis, bruises, burns, cancer, colitis, cuts, detoxicant [attracts toxins in blood and removes build-up via excretion], diabetes & other blood glucose imbalances, diarrhoea, eye-sight [Vit A/beta-carotene], HIV/AIDS, hormone imbalances, hypercholesterolaemia, hypertension, infections, immune deficiency, insect bites, lactation deficiency, liver & kidney problems, low energy & fatigue, malnutrition, obesity, osteoporosis, parasites [internal], pregnancy problems, nervous conditions [anxiety], rashes, respiratory problems, scurvy, skin conditions, slow metabolism [metabolic stimulant], viral conditions ……. I’m particularly interested in the virtue of its galactagogic properties, being a firm believer in the value of breastfeeding. As therapeutic aromatherapists know, galactogogues are agents that establish, promote and maintain the flow of mother’s milk. Moringa is one of the most studied herbs in the Philippines, and several studies confirm its efficacy relative to problems with lactation. Moringa tea, capsules or powder are effective as lactation support even if given prior to delivery. To assist with normal lactation it is recommended to be given 3 days postpartum [after delivery] to induce milk flow or help the milk ‘come in’ without problems. Scientifically, the lactation enhancing effects of Moringa leaves are evidenced by a greater increase in maternal serum prolactin levels – the most important hormone in the initiation of lactation. The oil is excellent for baby massage, and in my opinion, 1000× preferable to baby/mineral oil! I make sure I stay stocked up with a few kilos to ensure there’s enough for all our new young grandchildren. In the Cape, mothers talk about ‘rubbing the baby out’ with oil – quite a mindboggling image – but you get the idea!! Moringa is an ideal massage medium for this bonding activity. Moringa also has a long history of use in Ayurvedic medicine, and Indian people have used the oil to treat many conditions, including acne and skin problems – since it tightens pores and helps remove black heads, as well as reducing blemishes. 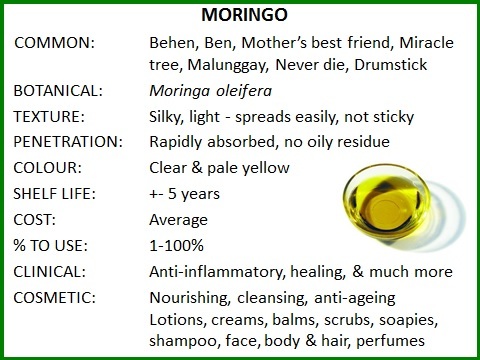 As intimated before, Moringa oil has many cosmetic applications. Because it balances oil secretion of skin it is great in cleansers and toners. In addition it has a remarkable capacity to remove grime [detox] from skin without clogging pores [non-comedogenic]. Could this action be related to its profound ability to purify water – and blood? It also counteracts the effects of pollution and other environmental aggressors [heat, sun, wind]. With an impressive oleic acid content of 72%, this nutrient-dense oil penetrates deeply into the skin, delivering vital nutrients while helping the skin and hair retain moisture. It keeps skin glowing and gives shine to lip gloss and creams. Japanese and Korean women are said to be the top consumers and users of Moringa seed oil – which may explain their great skin. A simple face serum can be made with 60% Moringa:40% Macadamia oils. Although there are new and innovative scientific ways to reduce wrinkles and restore vitality to the skin, much of the secret to youthful skin simply lies in maintaining a healthy living environment for skin cells to live – and Moringa oil achieves this goal perfectly. Moringa oil, like olive oil, is useful in lifting dirt out of the hair and is an efficient natural hair cleanser. By simply wetting the hair, massaging the oil into the scalp and rinsing off one can effectively clean and moisturize the scalp. 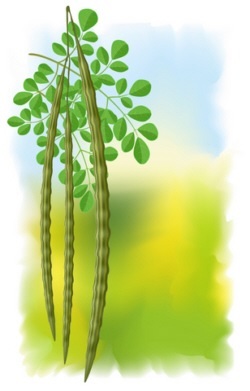 In general, Moringa improves the health and strength of both hair and scalp. Regular application and scalp massage can also reduce split ends and prevent dandruff and cradle-cap. And for the soap makers out there, Moringa oil has inherent antiseptic properties, produces a rich, creamy lather, and unlike any other plant-based oil, actually increases the cleansing ability without drying the skin. Because Moringa contains powerful antioxidants, and absorbs quickly into the skin, it is as good a choice to add to beauty products that are rinsed off the skin [such as soaps and scrubs], as it is for leave-on products like cosmetic creams and medicinal unguents. In conclusion – if you haven’t tried Moringa yet do yourself a favour and give the leaves, powder and oil a try as soon as you can. Or better still – plant a tree or two in your garden or pot-garden. I’m on a mission to give everyone I know either some seed, or a seedling, so that they can add this incredible gift from Nature to their daily diet.